When I started this series, I challenged myself to make these hot pads using the same basic shape every time. I didn’t have any trouble coming up with lots of ways to use it, but the other day I tried something that opened up a whole new set of ideas: I turned it upside down. Why that had never occurred to me before now I cannot say, but that’s what lead to this month’s springy theme. You’re getting a little bonus this month, because once I’d gone down the umbrella path, the raindrops followed. They’re the easiest thing ever to make, and add a little something to the hot pad. I think this set would be fun to use on a table for a baby or bridal shower. Let’s make it! To start off, you’ll need this pattern. The coasters are included. If you’re going to paper piece the stripes onto the umbrella, as I have, you’ll need two copies of the first page. If you’d rather make the umbrella from one fabric, just print one. Layer the handle pieces with the InsulBright or batting first, a fabric piece right side up and the other fabric piece right side down. Stitch around 1/4” from the edge, leaving the top of the “J” open. Clip the inner curve generously and clip off the corners. Turn right side out through the opening at the top. Press. Stitch around the outside near the edge. Set aside. Trace the lines onto the back of the umbrella pattern you’ll be using for paper piecing. On that side of the pattern, lay piece 1 down over the center, right side up. Lay piece 2 right side down on top, making sure it both covers the stitch line and will cover section 2 completely when turned out. Pin in place. I like to flip it over to the side I’ll be sewing on and re-pin, removing the first set on the back, so I can easily take the pins out as I sew. Stitch along the line between sections 1 and 2. Trim the seam, cutting the fabric only. Flip section two right side up and press the seam with a dry iron. Repeat the process to add section 3 on the other side of section 1. After that’s done, do the same to add 4 and 5. Sections 2 and 3 will want to bump up a bit because of the slight curve, so make sure you force them flat when stitching. Flatten the sides and pin them to the paper pattern. 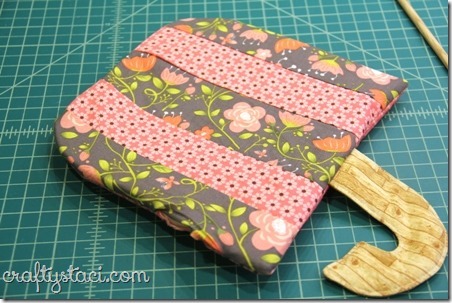 Cut around the outside edge so you’re left with the umbrella shape. Carefully tear away the paper. Press this piece well. It will likely still not lay flat, but don’t be concerned. It will when it’s completely finished. Layer the umbrella-shaped InsulBright, batting and back piece, right side up. Center the handle at the bottom with the handle to the inside. Lay the front piece over the top, right side down. Pin generously at the top edge where the front is still trying to curve. Pin around the remaining edges, making sure to catch the handle. Stitch around 1/4” from the edge, leaving 3” open on one side. Clip corners. Turn right side out. Press, turning in the opening. Stitch around the outside close to the edge. To make the coaster, simply layer the InsulBright, batting, fabric right side up and fabric right side down. Pin. Stitch 1/4” from the edge, leaving 1 1/2” open on one straight edge. Clip the top point. Turn right side out. Press, turning in the opening. Stitch around the outside, close to the edge. It doesn’t get easier than that, and it’s such a cute companion to the umbrella. You know what they say – April showers bring cute stuff to put on your table that makes getting through the spring rain a whole lot easier. Or something like that.